What better way to experiment with fun drink recipes than an adults-only Halloween celebration. I love entertaining but the stress of a big party doesn’t much appeal to me from a host’s perspective. I’m all about the more intimate gatherings. A small group is much easier to manage and that way everyone can enjoy themselves – host included. This Witches Brew is a ton of fun and will knock your friends’ striped socks off. I’ve had this cocktail chemistry kit in my bar for ages and I’d been wanting to experiment with it, but never made the time. The Halloween season is perfect for making spooky drinks so I decided to dust it off and use Soy Lecithin to make a stabilized foam, you know the kind fancy restaurants use to impress their guests. You can do this yourself at home with a few key ingredients. You will need to get together the essential ingredients. 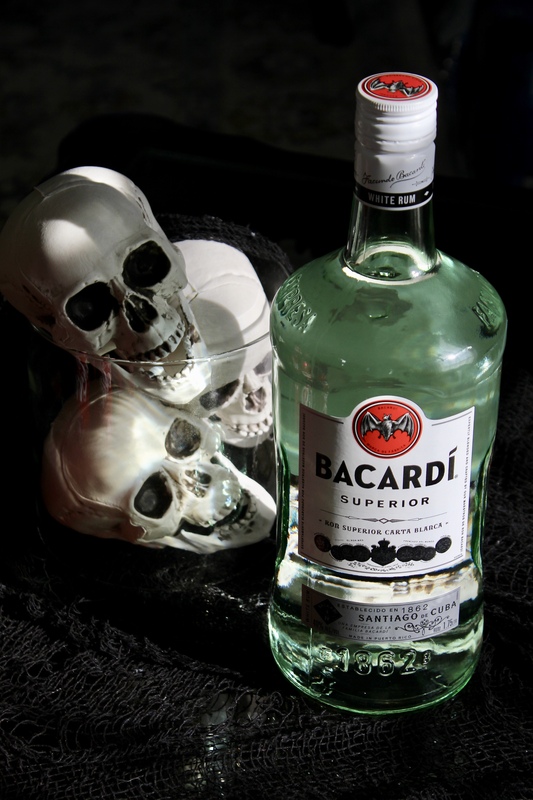 First, the BACARDÍ® Superior rum. Is there a more perfect liquor for Halloween?! I mean there is a bat right on the bottle, and if you know me I am all about connecting the theme whenever possible. BACARDÍ® rum is a people pleaser – everyone likes it and you can truly make a drink for everyone with it, no matter what their taste in cocktails. I’m positively addicted to saving with Ibotta. Don’t forget to take advantage of this current offer: Save $3 on purchase of BACARDÍ® Superior, Gold, Black, Flavors, or Oakheart Spiced Rum 750mL or larger now until October 31, 2018. The next item you will need to gather are your Coca-Cola® Mini Cans. 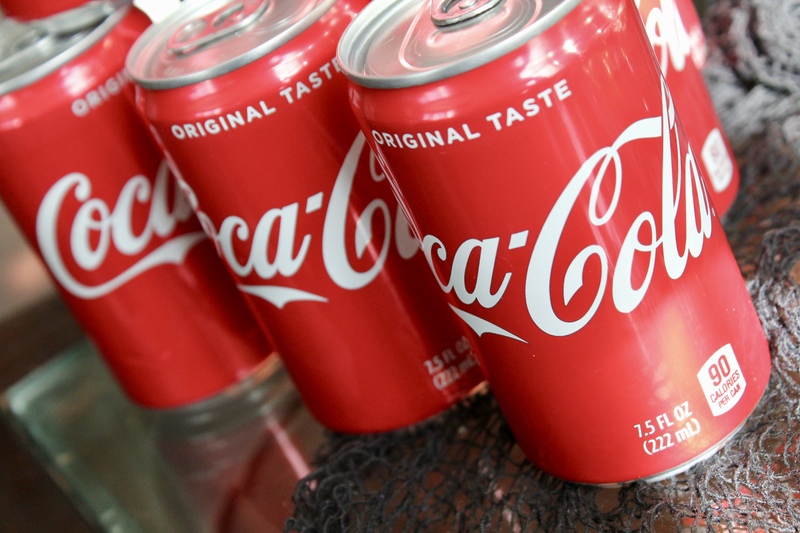 Nothing beats sharing the classic delicious cola taste with friends and family. We keep Coca-Cola® cans in our basement fridge just in case friends stop by. I just love these minis; they’re perfect for bartending! 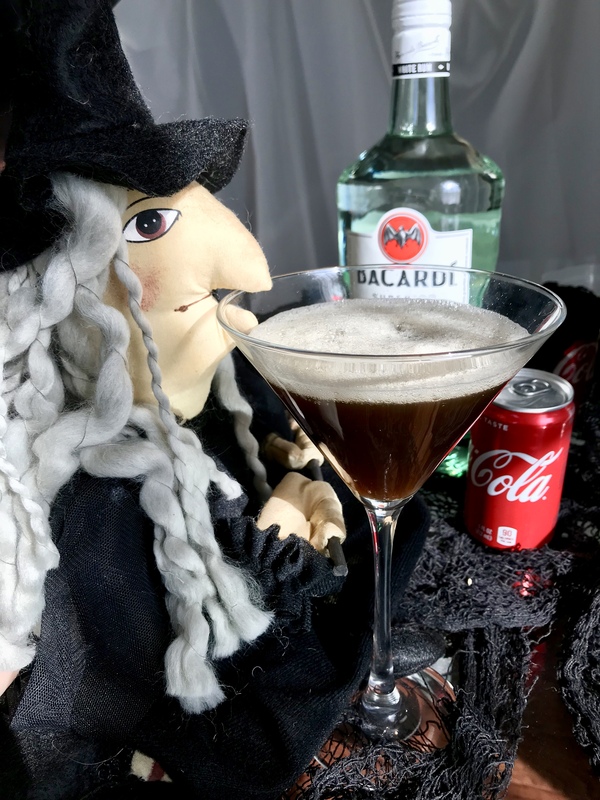 You might call our Witches Brew a rum and coke. It’s much more than that as you will see but you do need to start with the main drink. According to their website, the proper way to make a BACARDÍ® and coke is two parts cola and one part BACARDÍ® Superior rum so that’s how I mixed mine. You can either stir or use a shaker, whatever you or your guests prefer. Now comes the fun part. Take a pack of Soy Lecithin and mix it with whatever you want the foam to taste like. I used the Coca-Cola®, but if you want another flavor you can have fun coming up with other combinations. 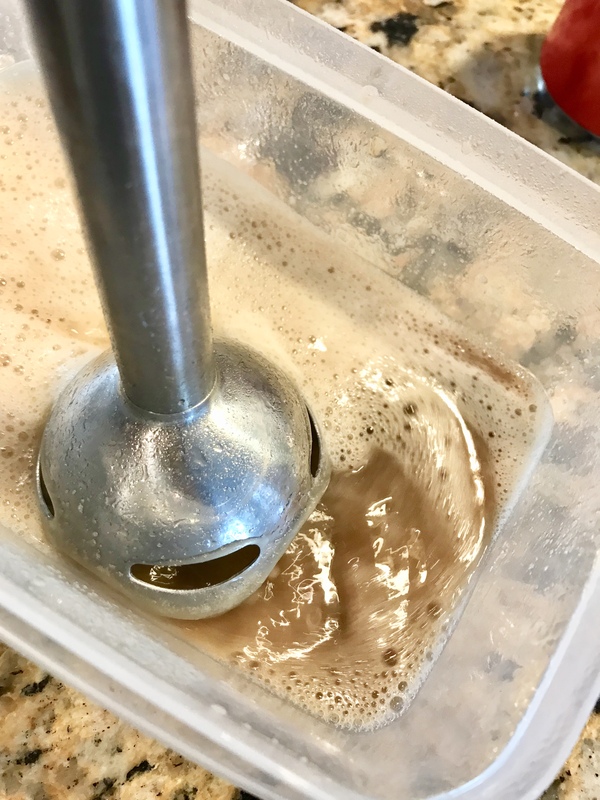 Once the liquid and power mix, let sit for a few minutes before using an immersion blender to make it into the perfect drink topper – foam! Unlike the bubbles in your soda, this foam will not fizz out due to the Soy Lecithin trick. But you can tell your guests you used a witch’s spell and no one will ever know. Find more fun party recipes here. Mix 1 part BACARDÍ® Superior Rum with 2 parts 2 parts Coca-Cola in a chilled shaker. Meanwhile mix the ½ cup Coca-Cola with Soy Lecithin and let sit after combing. Add mixture into a shallow dish and use an immersion blender until a foam mixture stabilizes. Pour drink into a glass and spoon foam on top. This is a really fun Halloween cocktail. I can’t wait to make this recipe for my friends. This is such a cool trick with the soy lecithin! I had no idea it could be used that way. I don’t drink but this would be a great option for our holiday party. I bet it would be a hit. That looks super cool! I love the way the color turned out too. That is a really neat recipe! I would love to try one! Whew, now that is a real monster! It came out looking very nicely too! I’m more of a mocktail kind of gal these days, but I will admit that this Bacardi and Coke mix is calling me. 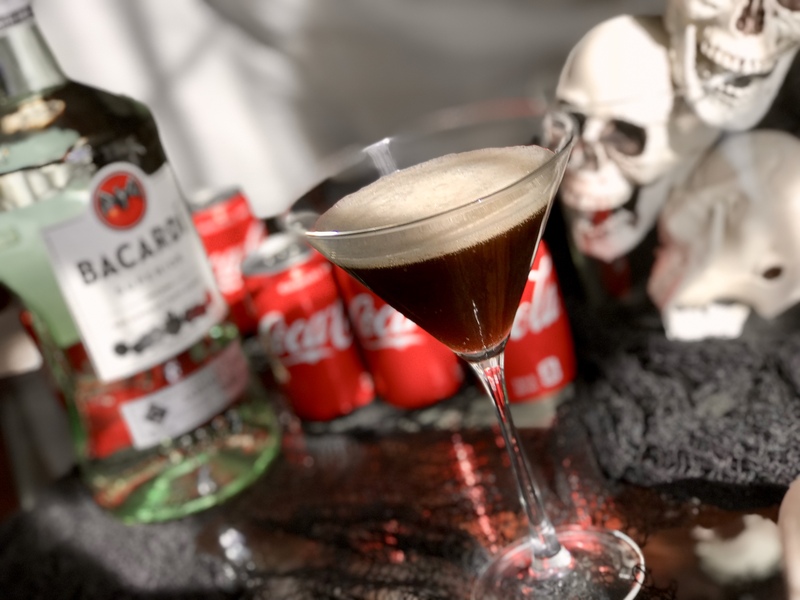 This is such a fun spooky drink for me to serve at our adult Halloween party! I love how easy it looks to make. Yum, I’ll have to try this out. It looks like a tasty drink. I haven’t had a cocktail in a while.